First thing I have to say: it is absolutely delicious and no Pita bread I have tasted before can compete with it. Its round shape makes it easy to rip it in half and fill it with ingredients you desire. The Egyptians usually rip of small parts and dip it into a traditional stew made of fava beans or traditional tahina salad. It is perfect street food and you will find it on every corner. Little bakeries literally work 24/7 and pump out bread and best of all its only 1 pound per piece. It is a very popular dish in the Middle East, but it differs from country to country. Fattah goes all the way back to ancient Egypt where it was served at big feasts and celebrations. It is a combination of rice, bread and meat and a vinegar/tomato sauce. Again very carb loaded, but super delicious. It’s a simple and satisfying dish, but very filling. Make sure you are hungry when you order this traditional dish! I literally can’t think of anything more typical Egyptian than tahina salad. You will find it in every Egyptian restaurant and in every little street food stall you’ll walk past. It is tahina mixed with some lemon juice, garlic and some water for its texture. It is a nice addition to your flatbreads that also gets served as an entree with all meals. perfect for vegetarians or meat eaters. 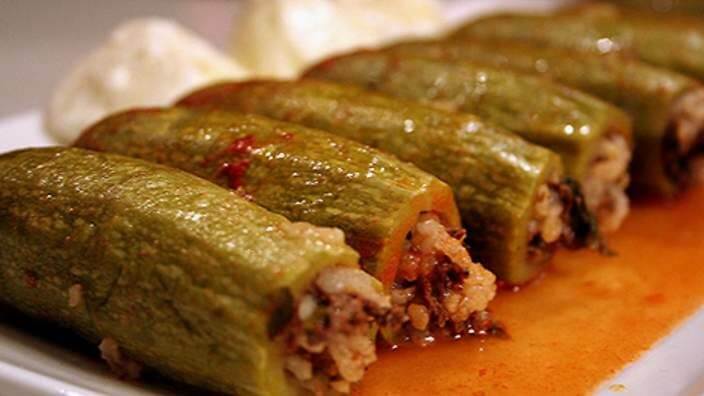 Mahshi are stuffed vegetables such as zucchini, eggplants, cabbage, tomatoes, capsicum or squash with either rice or minced meat. It is a favourite hit amongst Egyptians. Mahshi is definitely a dish you have to try when in Egypt. It is also great to order it whilst out for dinner and take it as a quick snack for the next day. is translated to Ali’s Mother and it is a very sweet but typical Egyptian desert. If you haven’t realized by now, the Egyptian cuisine sometimes is not the healthiest. They like to use a lot of sugar and the Egyptian cuisine is very carbohydrate rich. Om Ali is made from pastry, sugar, milk, raisins and topped with coconut, almonds, pistachio nuts and pine nuts –Egypt’s version of bread pudding. It gets served hot in a little baking dish with a scoop of ice cream on top. It is no surprise why it’s a hit, it is delicious! Make sure you’ll leave some room after dinner for this treat. It actually originates in Greece known as the popular gyros but of course the Egyptians have their own version with their own twist. It is made up of a choice of chicken or beef. The meat is marinated in cumin, turmeric, coriander, garlic and paprika and cooks all day on the spit with a fat melting on top. The meat is shaved off and put into a wrap where it’s wrapped and toasted to perfeection. In sit-down restaurant you can also order it with rice instead of bread. A MUST try if you’re visiting Egypt and my all time favourite. Probably one of the most popular dishes from the Middle East. If you haven’t tried it yet, you definitely should. The Egyptian version contains fava beans instead of chickpeas and also garlic, herbs, spring onions and leek. These little vegetarian balls get deep-fried and sprinkled with sesame seeds once they’re done. If you are open to try street food, I totally recommend you to try falafel from a street food stall. They make them fresh in front of your eyes and the flavours are usually better than in any restaurant. It is a dish/dip made of roasted eggplant mixed with tahina, olive oil and various spices. The smoky paste of eggplant can be found across North Africa, the Middle East, Turkey, Greece and increasingly on supermarket shelves just about everywhere else. In Egypt you will find it on most menus as a starter served with Flatbread. The perfect snack in the afternoon, if you don’t feel like ordering a main course. It’s no surprise that Egypt has an abundance of fresh fish and seafood dishes along the coastline of the Red Sea and the Mediterranean Sea. Especially when dining in one of the coastal resorts, seafood lovers will not be disappointed by the large and very affordable selection. Tagine dishes are slow-cooked savoury stews, typically made with sliced meat, poultry or fish together with vegetables or fruit. Common it includes spices like ginger, cumin, turmeric, cinnamon, and saffron. All tagines we’ve tried contained vegetables and tomato sauce and whatever meat you’ve picked if you decided for the meaty version. Tagines are generally served with bread and are very common among the cities along the Nile river like Luxor and Aswan. Is a traditional Middle Eastern sweet cake and it is to die for. It is made from cooked semolina or farina which is kinda like couscous. It gets soaked in syrup and milk before it gets baked. It comes out very moist and stays moist even if it is a couple of days old. Coconut is also a popular addition to this pastry. Definitely my favourite desert I’ve tried in Egypt (Freda). Last but not least. I have to mention it, simply because Dave basically lived of this dish for the first 2 weeks in Egypt. I’d say it is a must-try if you can find somewhere that makes it from scratch and not from a packet, we found these shop front restaurants in Giza where we could see the Kofta being shaped by hand and put over a smokey coal grill. They use ground beef and lamb mixed with fresh parsley, onions, garlic and Middle Eastern spices and the special flavours come to life over the open fire grill. Dig in if you are a meat eater! What are your thoughts on traditional egyptian food? Did I forget to mention anything or simply tell us what your favourites are ;) We would love to hear your thoughts on the above + see you implementing these ideas during your travels! Be sure to post to your Instagram story (or anywhere on social) tagging us @justgo.life so we can see + cheer you on! I'm into it! Sign me up.